Kendal at Oberlin is a vibrant Ohio retirement community that offers independent living in spacious cottages and apartments. 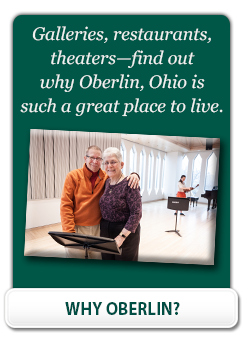 Enjoy easy access to exciting cultural and educational activities in the college community of Oberlin, Ohio. Situated on 107 beautiful acres, the campus features ponds and woodlands, walking trails and numerous amenities. As a continuing care retirement community, or CCRC, we also offer a full range of care services, if or when you need them. Having a plan in place for future needs offers priceless peace of mind. As a resident of Kendal at Oberlin, you have access to advanced options in the Stephens Care Center, including assisted living, skilled nursing and rehabilitation, all conveniently located on our campus near Cleveland, Ohio. Kendal’s Stephens Care Center specializes in person-centered care. Services include accredited program-based memory support services and a wide range of creative arts therapies. With a full range of therapies and a state-of-the-art fitness center, wellness and maximizing independence is our focus at all levels of service. To support residents through temporary care needs or transitions, Kendal makes licensed home health care services available through its partnership with Ohio Living Home Health & Hospice. Complete care coordination helps you navigate the health care services that may be required as you get older. Our goal is help you maintain the highest possible level of independence, while providing personalized, resident-centered support as you age comfortably in place, surrounded by caring friends and neighbors.